PAUL BISHOP ~ WRITER: PULP NOW: GORDON YOUNG’S SAVAGES! PULP NOW: GORDON YOUNG’S SAVAGES! DEBUT AT PULPFEST - SHIPPING NOW! 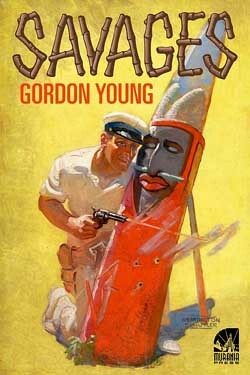 Gordon Young’s SAVAGES, the first of his Hurricane Williams novels, is a rip-roaring South Seas thriller originally serialized in Adventure magazine during 1919. Murania’s handsome new trade-paperback edition reprints the yarn in its entirety. It adds “The Unlisted Legion,” the 1918 short story that introduced Williams to pulp readers, and an introduction by Gordon Young scholar Tom Krabacher.